Having a baby in Spain is like getting a passport to a whole new world of acceptance. And it is great. I suspected it would be this way when the baby arrived, but the reaction of the Spanish people to me/us and the baby was still surprising. It’s rather nice really. A good example of this was during one of our first tentative postpartum forays out of the house to the local Covirán supermarket to pick up some essentials. I say tentative… it was more like shopping on a knife edge… would she wake? Would she cry? Would I need to feed her in the shopping aisle along side the papel higiénico and mop heads? In fact she slept through the whole thing of course, being less than a week old. When we came to pay I pulled out my bank card and was about to offer my driving license for ID when the lady at the cash desk, who had been checking my shopping (and ID) every week for the past nine months, held up her hand and told me that it was not necessary. My ID, that is, not my bank card. She cooed over Lil’ B and told me that she had seen me when I was pregnant and she knew who I was. Apparently now that we have a baby we do not need to prove who we are. 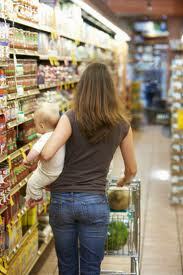 We are parents and that’s enough – proof, if any were needed, that we were good for the grocery money. Considering the size of me by the end of my pregnancy, I am amazed that anyone could have thought that I represented a flight risk.